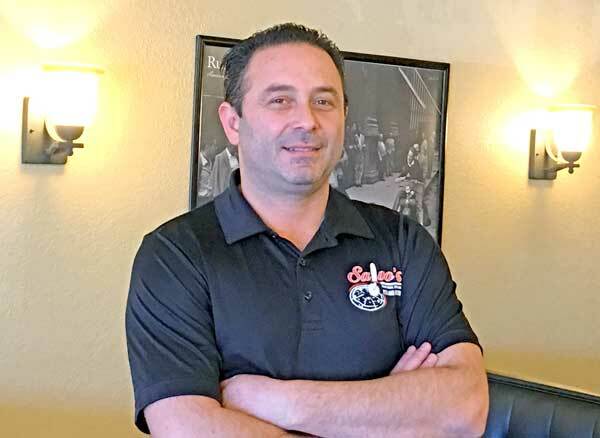 Salvo’s Pizza and Pasta: Now offering dining room service - Times Publishing Newspapers, Inc. While Salvo’s continues its tradition of preparing its pizzas using the finest, freshest ingredients, it recently expanded into new territory by adding a cozy dining room that seats 40 people. And if you enjoy a class of wine with your meal, you’ll be pleased to know that Salvo’s dining room is a BYOB. Salvo’s has established a reputation throughout the community of using old-world recipes of home-made dough, marinara and pizza sauce made fresh, in-house, every day. Salvo notes that he uses the same recipes for his sauces that his uncle used for 40 years when he owned his own pizza place, and after so many decades, this sauce still receives rave revues. You can taste the freshness when you bite into a piece of pizza at Salvo’s. Known for its marinara, meat and alfredo sauces, Salvo’s offers customers the opportunity to purchase these sauces separately to take home. Despite being recognized for its pizza and stromboli, Salvo’s lunch and dinner menus includes something for everyone’s unique palate ranging from paninis, sandwiches and hoagies to salads and wraps. Wings have always been a favorite selection at Salvo’s. Plus, a kid’s menu makes eating here enjoyable for the entire family. Salvo’s recently introduced a new menu that offers traditional pasta dishes. The linguini with clam sauce has already become huge hit with customers. Come to Salvo’s on Tuesdays and order any pasta entrée for two for only $16.99 or a pasta entree for four for $25.99. In addition to being family-oriented, Salvo’s also caters to the business community. Check out its lunch specials for $7.95 that changes daily. Also, for just $5.95, order a combination lunch of soup, salad and bread. Whether you’re planning a special event on a weekend or a business meeting during the week, consider ordering a catered tray from Salvo’s. Look for Salvo’s new catering menu coming out soon! Salvo’s Pizza and Pasta, located at 202 Holland Road in Northampton Township, is open Tuesdays, Wednesdays and Thursdays from 11:00am until 9:00pm; Fridays and Saturdays from 11:00am until 10:00pm; and Sundays from noon until 9:00pm. Come in and enjoy a meal in the new dining room. To place an order, call 215-942-2900, or visit www.salvospizzapa.com to order on-line.